. kitsune no yome-iri, kitsune no yomeiri　狐の嫁入り "the fox taking a bride" .
. Inari　稲荷　the "Fox Deity", "Fox God" .
. Inarigami 稲荷神 fox legends about silk, cocoons and the mulberry tree .
. Hikyakugitsune 飛脚狐 伝説　legends about fast fox messengers . Akita, Kochi, Shimane, Tokyo, Tottori, Yamagata.
. dokuro 髑髏と伝説 Legends about the Skull and fox .
. daimyō gyōretsu 大名行列　Daimyo procession - fox and badger legends .
. hanabi 花火 fox and firework legends .
. Jizo Bosatsu 地蔵菩薩と狐と伝説 and kitsune Fox legends .
. Kitsune no Atai 狐の直 / 狐直 from Mino .
. kuyoo 狐供養と伝説 Kuyo - Legends about Fox memorial service .
. Mino no Kitsune 美濃の狐 / 三野狐 The Fox of Mino. .
. nakōdo 仲人 Nakodo, legends about fox matchmakers for marriage .
. oni 鬼と狐 demons and foxes .
. otoka オトカ（キツネ）/ オトカサマ Otoka Sama .
. sentakugitsune, sentaku kitsune 洗濯狐 the Fox doing laundry .
. shichiya 質屋 pawn shop and fox legend .
. soba 蕎麦 Legends about buckwheat and foxes .
. tenpura 天麩羅 . 天ぷら Tempura and fox legends .
. yakan 野干 a monster beast from ancient China . probably ジャッカル jakkaru, jackal, or maybe a fox 狐.
. Yama no Kami 山の神 God of the Mountain and fox legends . Kuda-kitsune, kudagitsune クダ狐 or Kanko 管狐, "pipe fox"
In the Sōzan Chomon Kishū (想山著聞奇集) the kuda-gitsune is described as a rat-sized fox which can be kept in a pipe.
. Kudagitsune and tansu 箪笥 / 簞笥 chest of drawers . In the area is also known as kudasho and it seems that some people saw a cat capture it. It had black fur and they say it looked like a marmot. kudashoo クダショー, kudasho クダショ Kudasho Fox - Shizuoka . yako 野狐 nogitsune, "fox in the field"
Yako (野狐) is a spirit possession of foxes (kitsune), as told in Kyushu. To be possessed by it is called "yako-tsuki" (野狐憑き). The yako, literally meaning field foxes, are also called nogitsune. The appearance of a yako is almost completely consistent among all legends, and unlike real foxes, they are black or white, are slightly larger than a mouse, and smaller than a cat. The original yako is said to be invisible to the eye. In Hirado, Nagasaki Prefecture, they normally bring along a great crowd that walks with them, and thus there is the phrase "yako's thousand-fox company (ヤコの千匹連れ yako no senbiki zure)."
. Yamagata, temple 三蔵院 Sanzo-In Yako legend .
. Tōno monogatari 遠野物語 Tono Monogatari - Legends of Tono . A shapeshifting fox was once freaked out by a traveling business man. It transformed into dead person and freaked out the man to take revenge.
. Otoragitsune, O-Tora-Gitsune お寅狐 the Fox named Tora (Tiger） . オトラギツネ - オトラサン "O-Tora San"
. gingitsune 銀狐 the Silver Fox .
. Osaisangitsune おさいざん狐 a fox named O-Saizan .
. Gero Onsen 下呂温泉 Gero Hot Spring Spa fox legends .
. kitsune kooyaku 狐膏薬 fox medicine .
. 朱鶴 Azuru and the temple 茂林寺 Morin-Ji .
. Fox and Amida Raigo 阿弥陀 来迎 .
. Charcoal legends, 炭俵 sack for charcoal .
. Fox using ohaguro お歯黒 blackening its teeth .
. Matsumoto 松本市, bewitched by a fox .
. a fox takes possession of a human . Otohime gitsune is the name of a kitsune—and a goddess—who lived in what is now the village of Kyūhirota in Kashiwazaki City, Niigata Prefecture.
. Edo roku Benten 江戸六弁天 Six famous Benten in Edo and foxes .
. Fukiyachoo 葺屋町 and Sugiyama Daimyojin 杉山大明神 .
. Kakigaracho 蛎殻町 and kujaku 孔雀 a dead peacock .
. Oide Kitsune, Oidegitsune 御出狐 the Fox Oide and the shrine おいで稲荷 Oide Inari .
. The Ghost of a Dead Woman .
. three fox legends .
. kitsune-tsuki 狐つき bewitched by a fox . and kitsune otoshi 狐落とし getting rid of the bewitching from a fox.
. hikeshi Inari 火消稲荷 Firefighter Inari Fox .
. Fox and Inari legends .
. Fox and Duck 狐 鴨 - Tsurugaoka 鶴岡市 .
. Monogusa Taro 物ぐさ太郎 "Do-Nothing-Taro" and his kitsune nyooboo 狐女房 fox wive .
. tanuki to kitsune 狸，狐 the badger and the fox .
. tofu 豆腐伝説 Legends with fox and Tofu . The fox has a special relationship to tofu, especially fried tofu, abura age　油揚げ. They will be collected in a separate entry.
. The White Fox from Nara . There is an old family in Minowa. They tell a tale of a white fox who fell into the well and died on the first day of the New Year. Since then the family had misfortunes and lost all their wealth. The foxes from 野中 Nakano were eight siblings, and always played around human beings without any harm. Most of them took the form of a beautiful man and got married. This is the same behaviour as 池袋村の狐 the foxes from Ikebukuro village. 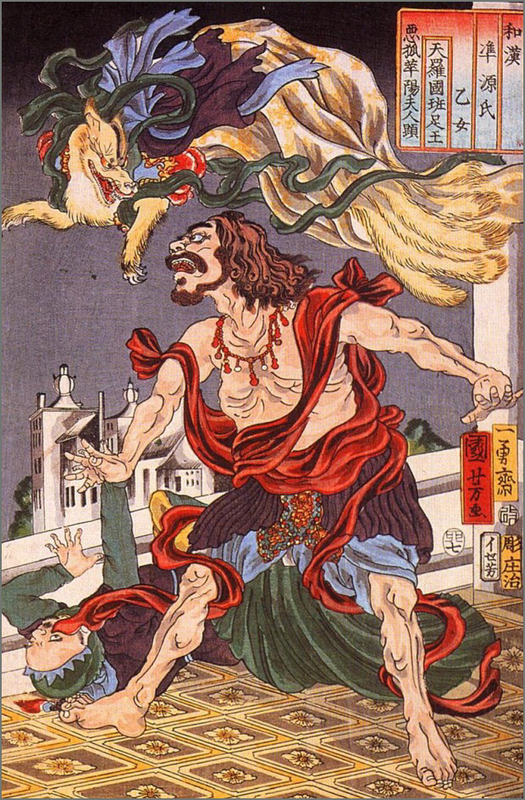 Osaki is a type of spirit possession of a fox told about in legends of Japan. They are also called osaki-gitsune. They can also alternatively be written 尾先. Other ways of writing them include 尾裂, 御先狐, 尾崎狐, among others. "osaki-tsukai" (osaki users), and so on. They never show themselves and are said to bring gold and silver, rice, and other things on a whim. Osaki-mochi are said to avoid contact with society and marriage with others and only marry among each other. This is said to be because if someone from an osaki family marries into another, the other family also becomes osaki-mochi, and this has often been one cause of societal tensions in relation to marriages.